This post was co-authored with Matt Pierce of Organic Chemistry Solutions. Ask Matt about scheduling an online tutoring session here. 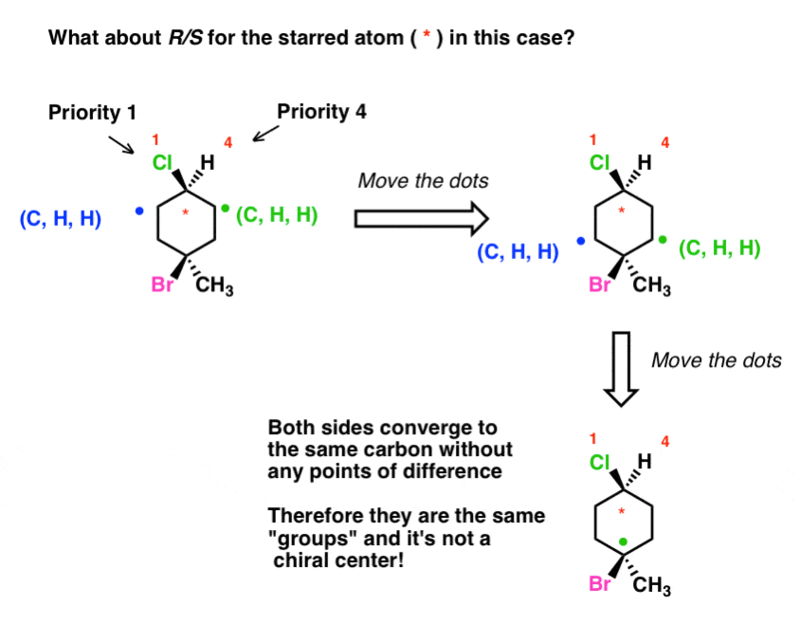 In our first post on the Cahn-Ingold-Prelog (CIP) Rules, we gave a broad overview of how to assign R or S to chiral centers in a molecule. We followed this up with a subsequent post on how to use the CIP rules to determine priorities in alkenes in order to determine whether they are E or Z. As with most introductory posts, the examples chosen were pretty simple. It’s fairly straightforward to assign priorities in a molecule like the molecules below where the central carbon is attached to four atoms with different atomic weights. And as we discussed previously, once you learn the single swap rule, it’s easy enough to determine R/S in cases when the #4 priority substituent isn’t pointing behind the plane of the page. In cases of stereocenters which are attached to identical atoms, we saw that it’s also pretty straightforward to use the “method of dots” to break ties and move down the chain. More on that in a minute: here are some exercises you can practice on if you like. This post is devoted to sorting out these slightly trickier cases. We’ll focus exclusively on determining R/S but the same priority rules hold for determining (E/Z) as well. Let’s start with a common trick question. What’s the highest priority “group” attached to the chiral centre in the molecule below? Assign R/S . Your first instinct might be to say, “the carbon chain containing the bromine”, since bromine has the highest atomic number of all the atoms in the molecule. In fact, the carbon chain containing the bromine is the third priority group (only hydrogen is lower! ), giving the chiral centre an R configuration. This is because of the way that priorities are assigned: we move outward from the chiral centre, one carbon at a time, and determine priorities at the first point of difference. First, compare the four atoms directly bonded to the chiral carbon and rank them based on atomic number. In our example, H is clearly priority #4. If there is a tie, list all three atoms directly bonded to the tied atoms in decreasing order of atomic number. I find it helpful to put dots on each atom I am comparing, which is why I call this The Method of Dots). Compare each list, atom by atom. 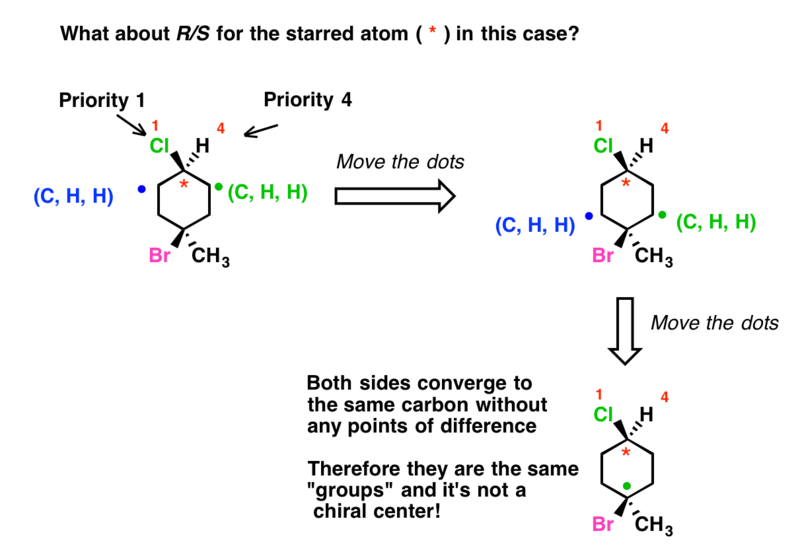 The t-butyl (C(CH3)3) group has the highest priority [C,C,C beats C,H,H]. but we still can’t differentiate the isobutyl group or bromopropyl group. 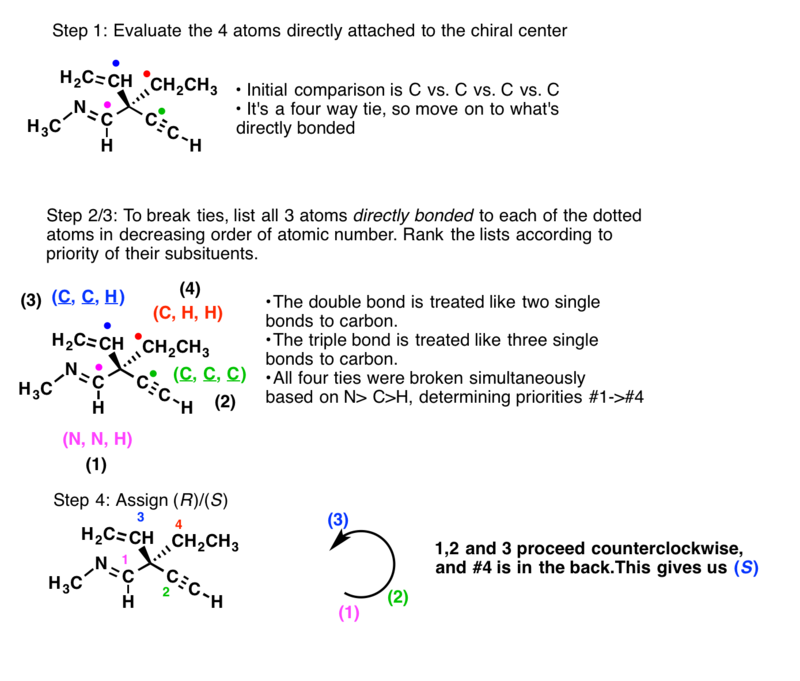 Because there is still a tie, we move the dots one step further down the chain, specifically to the next carbon because that has the highest atomic number (the dots help us keep track of where we are). This now allows us to assign priorities #2 and #3 [C,C,H > C,H,H]. With all priorities assigned, we’re ready to assign R and S by tracing the path of 1 → 3. Since #4 is on a wedge, the counterclockwise rotation signifies an R configuration (“opposite rule”). If this is still unclear, click here to bring up an image of a full step-by-step treatment. There’s actually no new rules required for determining priorities in rings, but many students tell me they have a hard time determining R/S if a chiral centre is on a ring. For this reason let’s go through an example and try to make this as clear as possible. There actually is one case where determining R/S on a ring might seem weird to the uninitiated. The molecule below has wedges and dashes indicating the stereochemistry of two carbons. What if you were asked to determine R/S for the starred carbon? Hopefully you see that this is actually a “trick question”. When we try to determine a point of difference, we end up converging back to the bottom carbon without finding a single difference. 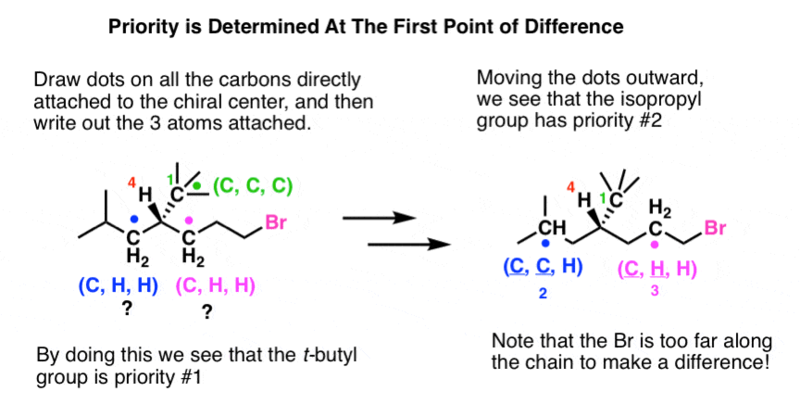 What this means is that these two “groups” are actually the same and the “starred” carbon isn’t a chiral centre. Molecules with multiple chiral centers don’t actually require any new concepts either. We merely have to identify each chiral centre and determine R or S for each. When we put together the final name, we then have to specify the configuration of each carbon at the beginning of the name. Hence the molecule above is (1R, 3R, 4S)-3-bromo-4-ethyl-1-methyl-1-propylcyclopentane. If you want to see exactly how the assignment for the (S) configuration was made, follow this link to a picture. The examples so far haven’t actually required any new concepts. However, the rules we’ve seen so far start breaking down once multiple bonds enter the picture. For example it doesn’t make intuitive sense that a methyl group should be higher priority than an alkyne. Clearly, a new rule is needed to deal with multiple bonds. The solution is to “expand out” each multiple bond as a single bond attached to a “phantom atom” (in blue). These “phantom atoms” are used solely for the purpose of determining CIP priority – they have no chemical meaning. Note that in the process of assigning phantom atoms to both atoms in a multiple bond involves the more distant atom “looking backwards” toward the chiral centre. This is the only time that we are ever allowed to do this! If we apply the “phantom atom” method to the multiple bonds in this molecule we then see that indeed the alkyne is higher priority than alkene, which is higher priority than ethyl. If the process of assigning priorities to this molecule seemed unclear, click here to see an image going through the assignment. For a good time, try and use our new method to determine the priority of vinyl, isopropyl and s-butyl groups (below). The process is described rather densely here. Is there a point where we stop caring about differences? For example, let’s say we prepare a molecule with deuterium instead of hydrogen such as in the molecule below. Does that still count as a chiral centre? Yes, this absolutely counts as a chiral centre. (Whether it would have a significant optical rotation is another story). Assigning priority here is actually pretty straightforward. In cases where the atomic numbers are the same, we break ties by assigning highest priority to higher atomic weights. For hydrogen, that means that tritium (3H) takes priority over deuterium (2H) which takes priority over protium (1H). Granted, this is not the kind of situation you’d be likely to encounter in introductory organic. But it does come up! And by the way, preparing chiral molecules containing deuterium is not merely a theoretical exercise – it’s been hugely beneficial for determining the mechanism of action of enzymes. See here for instance. For most cases, the “method of dots” will get you where you need to go to determine priorities for a chiral centre. 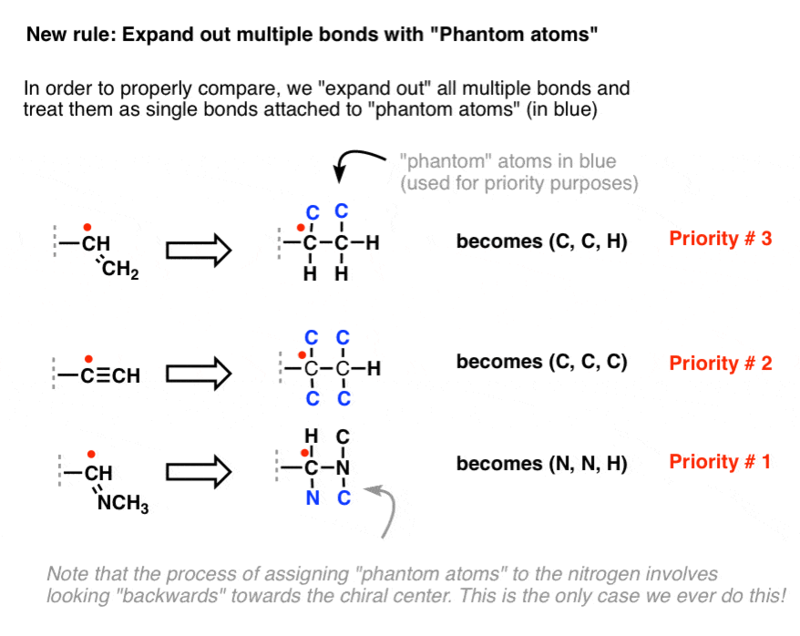 The one key thing from this post to remember is the concept of “phantom atoms” for determining priorities in alkenes and other multiple bonds. Anything missing that you want to talk about? Leave a comment! Thanks again to Matt for helping with this post. Hire Matt as your tutor! This post also didn’t address the chirality present in allenes and other species with an axis of chirality. In those cases we don’t use R/S, we use P/M. The CIP priority rules still work though. Didn’t get into this, but… is the middle carbon here a chiral centre? Not quite. That middle carbon is what’s known as a pseudo asymmetric centre. It does have 4 different substituents – the (R) chiral centre is different from (S). The IUPAC rule is that (R) takes priority over (S). The lower case letters (r) and (s) are used in this case. More on this topic here. 4. Uncle Al has a (theoretical) example of a molecule where CIP rules fail. Uncle Al also has some pretty strong opinions about chirality. Thanks a lot sir, this was really helpful. I have a doubt though, In the problem with the multiple bonds, how do you assign the phantom atoms? I mean, are they C atoms? Are they N atoms? How is that decided? For a C=C bond, the phantom atom is a C. For a C=N bond the phantom atom is N. For C=O the phantom atom is O. For a CN triple bond there are two phantom N atoms.